The fantastic garden, an art environment made by Luigi Buffo (1919-1997), does'nt exist any more. Born in Mareno di Piave, Treviso, Italy, Luigi Buffo from childhood on had to work as a farmhand, without enjoying any schooling. Later on he migrated from Italy to the south of France, where he had a job as a mason. He went to live in the small community of Lagardelle sur Lèze, south of the city of Toulouse. 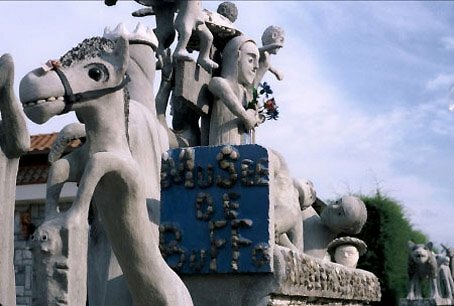 Around 1980 Buffo began making all kind of statues and sculptures from concrete, creations he installed in the garden of his house. He impersonated holy persons, ordinary people, animals and so on. He also has been making wooden sculptures. Luigi Buffo has been active in making sculptures for at least some twenty years. When I wrote the original version of this post, the internet just had a few sources about Buffo's life and work, like french weblogs Animula Vagula and le Poignard Subtil. There may be some written french sources (in periodicals), but these are out of my reach. Buffo died in 1997. 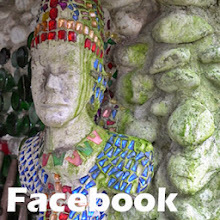 Around 2003 the inheritors, in order to sell the house, destroyed almost all concrete sculptures. 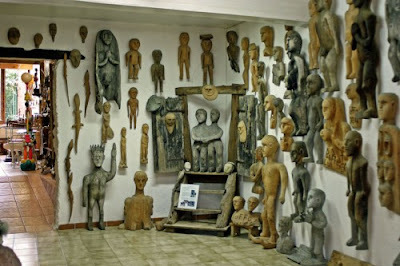 The wooden sculptures have been saved from being burned at the last moment, just because some interested people managed to get a deal with the family. So, thanks to Martine and Pierre-Louis Boudra, who run a small private museum on outsider, naive and folk art in the south of France, these wooden sculptures (picture above) nowadays still can be admired. The museum of the Boudra's, les Amoureux d'Angélique, is located in Carla-Bayle, in the Ariège department (More about this private museum, with a variety of pictures, in the weblog of Sophie Lepetit, april 5, 2014). How could anyone just casually destroy artwork ??? Hard to comprehend. Fortunate that some of it was saved from being burned. Hope you had an excellent summer, and were able to get away perhaps for a while to go visit some of these places ? Hi Owen, Sure this was a nice summer and the two of us enjoyed being away from the big city for some time, walking in the woods or going to the beach. And I am so happy I could pay a visit to dutch outsider artist Gerard van Lankveld. (It's related somewhere in a post). Really hope september will bring some more sunny moments. All the best. To destroy art work should be considered a crime by all means!!. What a crime, what a mutilation. Look all those extraordinary sculptures, lying completely defenceless towards the brutality and ignorance of the greediness. Fortunately somebody managed to save some of these pieces of art and beauty. we are not only talking about lifeless objects, but we are talking about the life´s work of a man, a human being, to destroy his legacy and memory in that way is a complete mess. But then again, at least a little of them could be saved, for we to enjoy and learn.